It was, as The New York Times called it in 1914, “distinctly fashionable to be married there, it was eminently respectable to be buried from there." Here were married Rhinelanders and Gardiners. Edith Wharton walked down the aisle here. Between 1887 and 1895 there were three Astor funerals – Mrs. John Jacob Astor, William Astor and Mrs. William Waldorf Astor. When former senator Roscoe Conkling died from exposure, having gotten lost in the Great Blizzard of 1888, the church was filled with United States Senators for his funeral. Six years later esteemed justices filled the pews at the funeral of John Jay. Indeed, the Episcopalian Trinity Chapel on West 25th Street near Broadway was both fashionable and respectable. 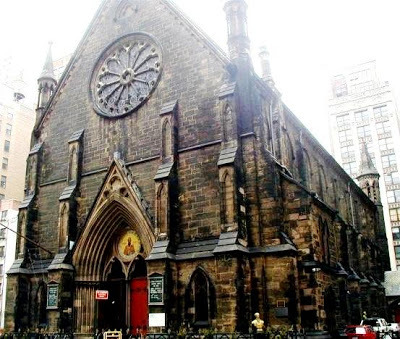 Spending $30,000 on land, the church provided the architect with a plot extending from West 25th street through to West 26th Street; the scope of which he used tofull advantage. 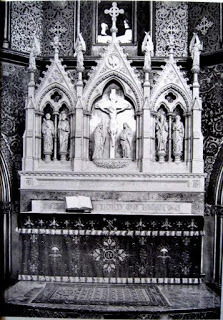 Upjohn’s Gothic Revival chapel filled the site, resulting in an interior space of unusual and impressive length of nearly 180 feet. The architect was responsible for the interior decoration as well – the stained glass windows, the polychrome tile floor, intricately carved beams and knee brackets. Light-colored French Caen stone faced the walls and touches of color outlined the truss work above. In 1866, Jacob Wrey Mould designed the enchanting Parish House in the rear at 16 West 26th Street and, in 1870 the Trinity School was erected next door. The buildings created a picturesque and romantic complex. 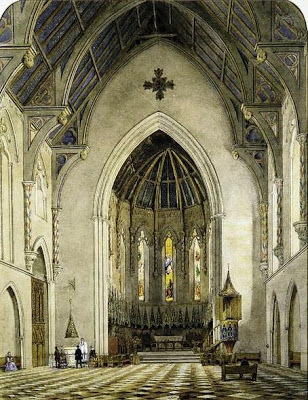 In the late 19th Century the interior was slightly redecorated to include color – 80 feet above the floor, a blue ceiling with gold stars was painted and the chancel walls were intricately decorated. But as the turn of the century passed and the gentry moved further up Fifth Avenue, the congregation waned. Richard Upjohn's magnificent St. Thomas Church with its breathtaking interior by John LaFarge at 5th Avenue and 53rd Street sat conveniently among the brownstone mansions. In 1914 it appeared that the chapel would be deserted and, quite possibly, demolished. 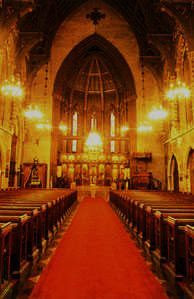 Although The Times was not enthusiastic about the architecture, saying “it has never been regarded by architects as an interesting or attractive church structure” and projected that Upjohn “probably never thought of making a chapel so far uptown a notable architectural work;” it lamented the potential loss. And yet the chapel staggered on. With its limited income, the church made few alterations to the interior until, on April 29, 1940, fourteen murals depicting the life of Christ were dedicated. The work of Rachel M. Richardson, the paintings took ten years to complete. Yet two years later Trinity Church finally put the building complex up for sale. In 1943 the Serbian Orthodox Church purchased it, establishing the Cathedral of Saint Sava. On March 7 of that year, Rev. Doushan J. Shoukletovich, the rector, conducted the first service for the congregation in their new home. A few years later the exiled king of Yugoslavia, would begin worshipping here. In 1962 a beautiful oak iconostasis, carved in a Serbian monastery was installed. Meanwhile, the Communist Party of the United States established their headquarters at 23 West 26th Street, next door to the complex. Anti-Communist terrorism resulted in no fewer than six bombings in the building between 1964 and 1972. One, on September 4, 1966, was powerful enough to blow out the 115-year-old stained glass windows in the apse of the church. The Cathedral commissioned replacements in the Byzantine style, more appropriate to the Eastern tone of the religion. By the 1990s, the structure suffered from lack of maintenance. Serious roof leaks resulted in the dissolving of the interior Caen stone walls in some areas and the misalignment of the roof framing. Historic conservator William Stivale was hired to oversee the multi-million dollar restoration. The Historic Properties Fund of the New York Landmarks Conservancy provided $475,000 while private donations accounted for most of the balance. The buildings today are a remarkable collection of Gothic Revival architecture. Upjohn’s interiors are nearly untouched, despite their sometimes rocky past.